This is a super easy recipe for sweet tart dough; it’s very basic but works very well. I’m not a huge baker, but I love making tarts because they are easy to make crowd pleasers and you can always change it up with a different filling. You can give this recipe your own personal touch by adding spices such as cinnamon, ginger, nutmeg, all spice, or even dry herbs such as mint, lemon verbena, etc. to the dough to give it an additional touch of flavor that will complement the filling. The quantities in this recipe are for 2 9-inch tarts; my thinking is that if you’re going to go to the trouble to make a tart, you might as well make two of them. You can give the extra tart to your neighbors or take it to work (co-workers will love you). Or you can use different fillings for each one and people will be impressed that you made two different desserts. 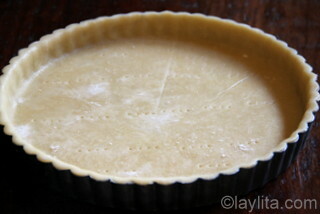 You can also freeze the additional tart dough for later use. Of course you can also half the quantities and just make one tart. 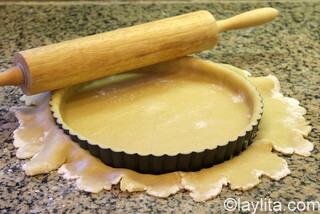 If you need a savory tart dough recipe, you can find it here. 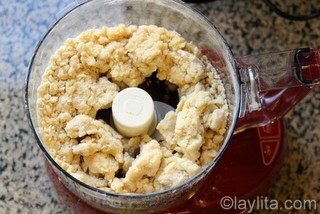 Add the butter pieces, in batches, and pulse until mixed. 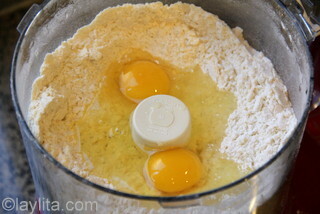 Add the eggs and water, 1 tablespoon at a time, until a clumpy dough forms. 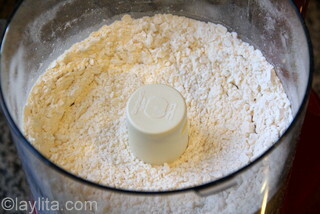 Remove the dough from the food processor and knead it gently for a few minutes. 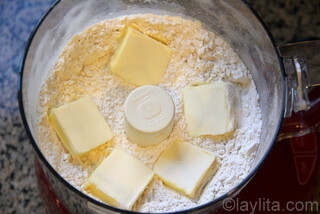 Form dough into 2 balls (for 2 tarts), flatten into thick discs, and chill in the refrigerator for at least 30 minutes. On a floured sheet of wax paper, roll out the dough into a thin sheet that is larger than the tart mold you plan to use – it’s okay if it extends beyond the edges of sheet of wax paper. 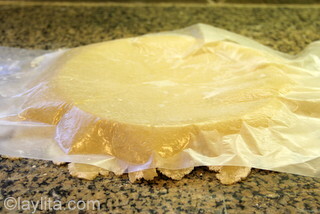 Flip the paper and the sheet of rolled pastry dough on to a lightly greased tart pan. 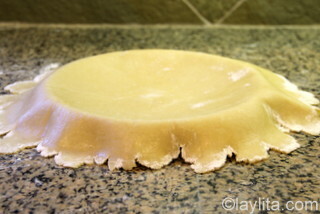 Gently press the dough with your fingers onto the mold, start at the center and move outward. 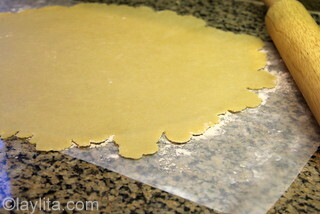 Use a rolling pin to roll over the edges and remove any excess dough from the edges. If you want you can leave a ½ - 1 inch to wrap around the edges of the pan – this will help prevent the crust from shrinking. 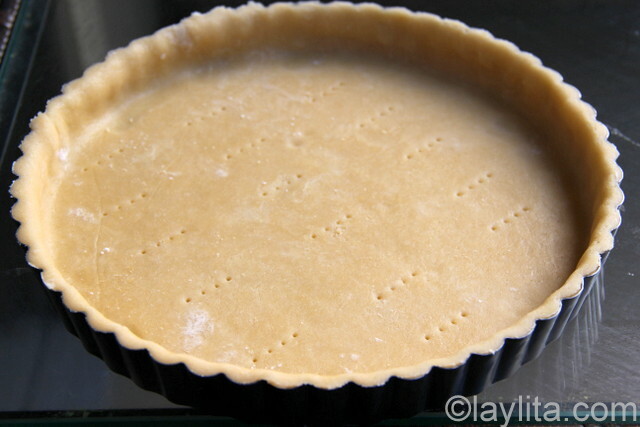 Prick the tart shell with a fork and let it rest in the refrigerator for at least 30 minutes or until ready to use. If you need the tart shell to be partially baked, pre-heat the oven to 375F-400 F, line the shell with foil and fill with beans or baking beads. Bake for about 20 minutes, just until the edges begin to get some color. If the edges get very brown you might want to cover the edges with foil while cooking the tart (once the filling is added). 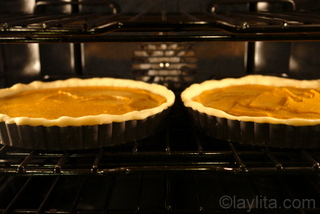 Baking time and oven temperature for the tart will depend on the filling you use and whether or not the tart shell was pre-baked. Hi! Love your site. i have tried a couple recipes and everybody has loved them! got to ask you a question on this one. Is there any trick to prevent crust from shrinking while baking? I haven’t tried this particular recipe but the ones I have tried inthe past have shrunk. Can’t wait to try this one but I’d like to know if you do anything special beforehand other than refrigerating before baking. Laylita, here in Iceland butter does not come in sticks. Can you tell me how much butter is that?